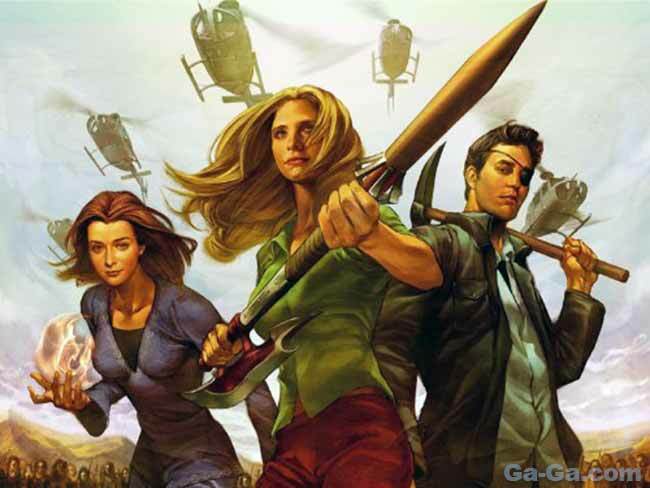 As a long time Buffy The Vampire Slayer fan, I tried reading the original “Buffy” comic book when it hit the stands a few years back, but couldn’t get past the “lifeless” version of Buffy sans the original actors, fun music, and dramatic moments. Even though I read a lot of comic books in my youth, the last graphic novel I read was the Frank Miller “Batman/The Dark Knight,” and the only anime I’ve been able to stomach in the past decade would be “Death Note.” When surfing the iTunes store on my iPad couple of months back, I saw the season was available as a “motion comic,” and decided to buy the “season.” I’ve been watching them as released in my “subscription,” and just finished the final episodes this past weekend while on the treadmill (iPad is great for this). Well, it’s not as good as the show, by any stretch of the imagination, and die-hard fans might be insulted by calling this the never to be seen 8th “real” season of the TV series about a teen girl inducted by the Watchers to save humanity from all sorts of evil, but first and foremost those pesky kung-fu capable vampires. Hard to believe Buffy is thirty (if you count back to the original movie, prior to the series) this month. Wow. I was in my late teens way back when. I won’t bore you with a history of the show, or the actors, or how great the show truly was. Both Buffy and Angel were a bright (or dark) spot on TV when everything else was sitcoms or stale dramas. For the motion comics, overall my feelings are a bit mixed. I was kind of happy to see Buffy in action, but lamenting the lack of carryover from the show beyond the use of familiar characters, both good and bad. Many of the choices for stories don’t seem to be plausible in the context of the brilliant way the TV show was plotted for the whole season with little nuggets dropped in the first episodes that would blossom into major plot points as the season progressed. This was the right way to do TV, not the “make it up as we go” process used on LOST. I liked the “episodes” written or storied by Josh Whedon, the actual creator of Buffy, but a few of the motion comic episodes (issues) had some pretty whacky stuff and I’ll try not to throw in many spoilers here, but Dawn being stuck as a giant and fighting a mecha-Godzilla-inspired robot clone, is perhaps a bit beyond anything we’d see on the TV series. The voice acting is pretty good, and the music is a superb mix of the original series music and other elements. I was actually impressed by the way the motion comic stories were brought to life with clever use of animating the panels, animating pieces of the comic book artwork, and 3-D “particle effects” for things like fire. Sound effects (foley) work helps to make it seem like a radio broadcast with video, and since this was my first foray into any “motion comics,” I actually found it entertaining. I thought Zander was pretty well done, but his character was often the comic relief in the original series. The villains chew scenery in typical comic book form, but some of the glue of dramatic scenes is lost in favor of the comic book genre’s panel format. Still, the digital artists have done an amazing job of bringing flat art to life, and this works very well for the most part, except in some instances where a small panel was missing detail in the faces. It works well on the iPad, but not sure I’d find this as watchable on a big-screen TV, although I might try that. If you tend to work and watch TV as a background entertainment versus sitting in rapt attention over each moment in time (as I did rewatching the entire Buffy and Angel series last year again), it would be perfect for the audio performances. Okay, a couple of spoilers. Buffy has a lesbian relationship, Amy comes back to wreak havoc, and Faith gets her bad girl groove on. Dracula makes an appearance, ninjas make an appearance, and one long-time nemesis of Buffy and Giles bites the big one. 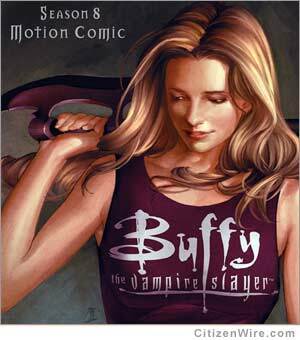 “Buffy the Vampire Slayer: Season 8 Motion Comic” is available on iTunes, Amazon on demand, Blu-ray/DVD combo. Run Time: 275 minutes. Overall, it’s a charming alternate universe kind of re-visit to the Buffyverse, but falls way short of truly being a new season of the show I loved so much. Still, if you’ve been craving something to sink your teeth into and couldn’t quite wrap your claws around the static comics, the “motion comic” is worth a look. ‘Nuff said. Article is Copr. © 2011 by Christopher Simmons. All rights reserved. No fee or compensation was paid to the author for composition of this article. Article originally appeared on CitizenWire.com and a version appeared on Ga-Ga .com / Musewire .com before permanent placement on ChristopherSimmons.com.